Just Another Day...: Movin' on Up! This is my first official blog post from 7C! That's right!! We made it! Chase has been an absolute super-star and has exceeded our expectations a hundred-fold with his recovery. Tomorrow he will be THREE WEEKS OLD!!! And tomorrow also marks TWO WEEKS since his Norwood surgery. I still can't believe we're upstairs already. 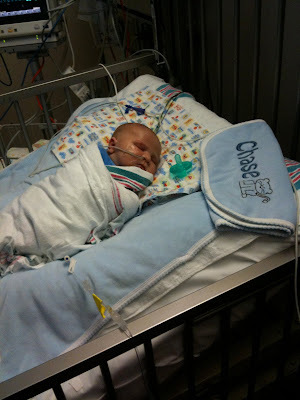 It should be interesting to see how it will be living here at the hospital with Chase while hubs is home with LO. In fact, tonight will be the very first night hubs and I have spent apart in the almost 4 years since we got married (Nov. 25th)! What a huge and significant day today is! Of course it's also my very first night with my sweet baby boy and I couldn't be more excited about plans that DON'T involve a good night's sleep! LOL! Here's our first picture of our little champion rockin' out on 7C. More to come later! Yay for 7C! Enjoy that hard plastic couch! :) I also had to put a blanket over the monitor so that I would not obsess over it! They called me the monitor mom!! I hope Heather (the nurse) is still on 7C! She was our favorite! Go Chase!! CONGRATULATIONS!!! I am so happy for you and Chase. It is a wonderful feeling to move to step-down...even though you will get very little sleep. It prepares you for when Chase is home!